Join us in celebrating the release of the time management book that solves every known productivity challenge to mankind… and womankind! The party was held on Thursday, April 28, 2016. If you couldn’t make it, or if you don’t live in San Antonio, click here to find out how else you can help support both Helene’s book and homeless female veterans! You can view book launch party picture here! RSVP here on the Facebook event page. Please share this invite with your friends and colleagues via email and your social media platforms! 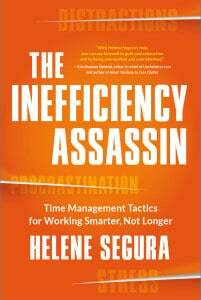 For details about the newest of Helene’s time management books, visit TheInefficiencyAssassin.com.